McCormick Real Estate & Management presents Jacob Center located in Greentree, PA. 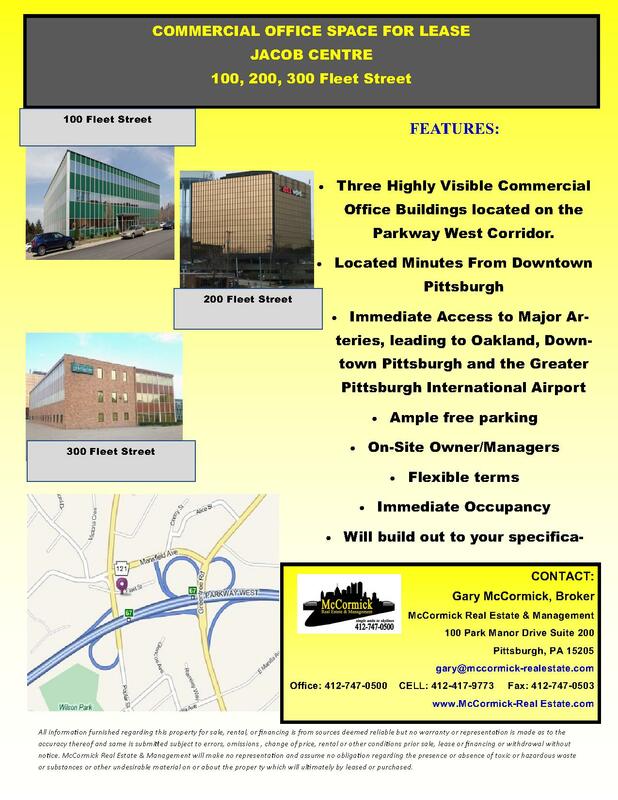 This office complex consists of three professional office buildings uniquely situated minutes from the entrance and exit ramps to I-376 (the Parkway West) leading to Downtown Pittsburgh, the Greater Pittsburgh International Airport and Interstate 79. Jacob Center is an appealing site for many businesses due to its proximity to major entities in and around the Pittsburgh area. In just minutes from Jacob Center, you can be on your way to business appointments, luncheon meeting at a local restaurant, or last minute shopping at one of the many small shopping areas. Jacob Center provides ample “FREE” Parking and is surrounded by several Public Transportation Routes. 100 Fleet Street is a 3 story office building with a green exterior and hosts many professional businesses including a law firm and staffing agency. 200 Fleet Street is the most visual building of Jacob Center. Its bronze exterior shines during the daylight and early evening hours. It is also home to Pittsburgh’s WDVE Radio Station. In fact it is also nicknamed, “the DVE building.” This eight story building also serves as home to the offices of the property owners who are often on-site. Exclusive to this building are the two lower level parking garages. 300 Fleet Street is a two story office building with a red brick exterior. The rear of this building faces the Parkway West (I-376). Many of these offices are home to medical practices/services. 100 Fleet Street (a/k/a Building 1) $16 per sq. ft.
200 Fleet Street (a/k/a Building 3) $18 per sq. ft.
300 Fleet Street (a/k/a Building 2) $17 per sq. ft. The owners are willing to do build-outs to meet your business needs, including expansion, for long-term tenant leases. Contact McCormick Real Estate and Management at 412-937-0500 to schedule a visit to the properties or with any other questions.